Never Write the Word “Study” in Your Planner. Here’s Why. Well, obviously that’s not completely true. My passion is teaching students to study strategically, and I couldn’t do this work if the word “study” weren’t involved. However, I do believe strongly that the word study does NOT belong in a student’s planner or To Do list. Neither does the word “review.” Check out the video for a full description of why. I was working with a client recently on the skill “verberizing,” which is about finding really strong specific words for the tasks that you need to do when you are doing homework or studying to make it an easy instruction for you and your brain to know exactly what you need to do next. Now before we continue, I want you to look at the following four options and think about which of these would be the best way to verberize “study french” in her planner. My client had written, “Study French,” to which I cringed and said, “Eeeh, I don’t like that.” Of course, she responded, “Oh my god Gretchen you always make me change these,” and I thought it was rather funny, but said, “I know, so let’s do it.” Next, she erased “Study French” and wrote “Review Subjunctive.” I still said it wasn’t clear enough. Then she wrote, “Go over Subjunctives.” This was getting there, but “go over” still doesn’t tell me what she needs to be doing. It’s very broad, and I can’t picture in my mind what the steps would be for “go over subjunctives.” So I had her change it one more time. This time she wrote, “Finish subjunctive worksheets.” This was MUCH better. You see she realized she had unfinished worksheets for subjunctives, and what better way is there to study subjunctives than to finish the worksheets – a readily available tool. Not to mention this tells her exactly what she needs to be doing next. Now you might be wondering, why is writing super specific instructions in your planner so important. Well, the answer is that “verberizing,” or making sure your planner has crystal clear instructions, is important because it helps ensure that your brain has no excuses about following through on your plan/to-do as the instructions are so simple and crystal clear. 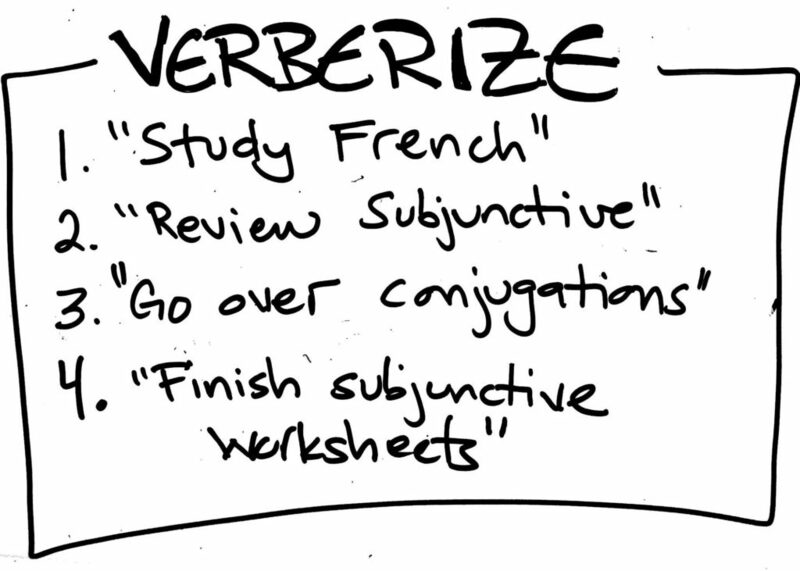 If you’d like more instructions and information about “verberizing,” including an extensive list of verbs you can use in your planner, you should check out my course!